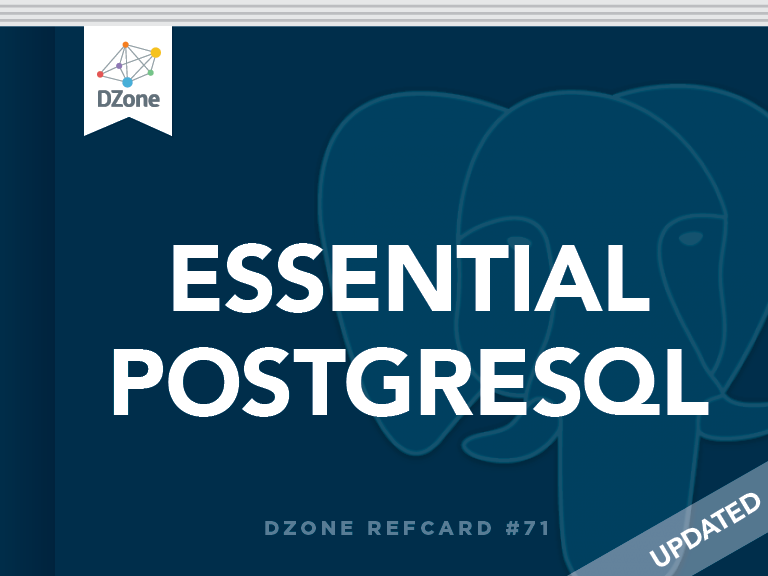 We are happy to announce the release of DZone's latest Refcardz publication: an update to Essential PostgreSQL by Regina Obe and Leo Hsu. We are happy to announce the release of DZone's latest Refcardz publication: an update to Essential PostgreSQL by Regina Obe and Leo Hsu. This invaluable reference gives you basic information and advanced tips for using this powerful open-source database! With a focus on new features in PostgreSQL 9.3 and 9.4, you’ll quickly learn to navigate some of PostgreSQL’s most popular features as well as its hidden gems. PostgreSQL is an open-source object-relational database with many enterprise-level features. It runs on numerous platforms: Linux, Unix, Windows, and Mac OS X. It is simple and quick to install, fast, and it sports advanced features such as: streaming replication, spatial support via PostGIS, windowing functions, table partitioning, and full-text search. In addition to its enterprise features, it has the added benefit of supporting numerous languages for authoring stored functions. It has an extensible procedural language architecture to introduce new languages.